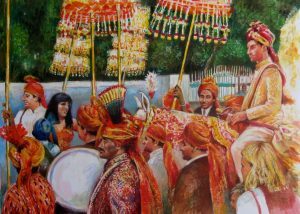 I am often asked to create unique and special pieces ranging from wedding scenes such as Bharat for which I travelled to Delhi, to portraits such as Happy Times. Commissioning artwork involves an initial consultation to discuss details such as image, size, medium and timescale. This initial consultation can be face to face or via Skype, email, by telephone or by post. Following this I will send an invoice with full pricing including postage and packing and estimated time frame for the commissioned work. If you want artwork based on a photo it would be helpful to provide high resolution photographs for me to work from. 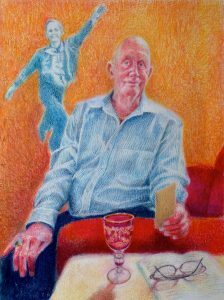 For portrait commissions it is useful to have at least two sittings or more. I am happy to attend a special function or event and do initial sketches to work out the overall composition of the finished piece. Once we have agreed on the artwork a 50% deposit is requested with the final 50% paid on completion. For portrait commissions payment is in three instalments. The first is at the initial stage, the next halfway through and the final one when the portrait is completed. All work is sent unframed in secure packaging via courier with guaranteed next day delivery. If you require framing this can be arranged and the cost will depend on the kind of framing required. I use a bespoke framer in Buckinghamshire who will tailor frames to your needs and colour match to an existing home setting if required. I also use a well-estavblsihed framer in Oxfordshire who can frame work within a week. Choice of frame and framer is usually discussed and decided at the start of a commission.